All of our programs can be adapted to suit the interests and understanding of PreK/K children. Join us as we learn that even though air is invisible it is around us all the time. Preschoolers will learn that air has the power to both move items, and to slow them down. They will also experiment with a variety of items that rely on the air to help them move. We will investigate the habits, needs and characteristics of dinosaurs while we explore the fossilization process. Learn about paleontology while excavating for fossils (dino bones) and find out what they can tell us about the dinosaurs. Let’s learn more about our sense of sight! 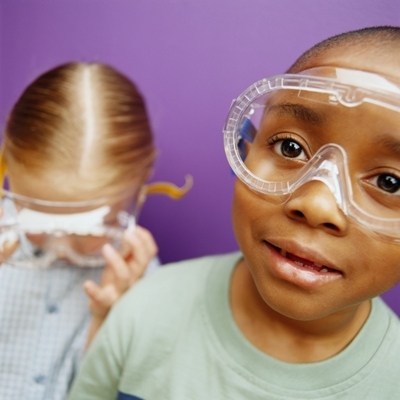 The children will experiment with magnifying glasses, kaleidoscopes and binoculars. They will also interact with a variety of optical illusions to illustrate that your eyes can sometimes play tricks on you. Children will learn how they understand the world with their sense of touch. We will also emphasize that some objects are safe to touch while others are not. The preschoolers will be presented with the challenge of identifying a variety of objects by using only their sense of touch. Shhh! Listen closely! There are sounds all around us. Children will experiment with a wave motion model and a twirling tube that will help them understand that sound travels in waves and can be heard in a variety pitches. Also, they will have the opportunity to learn about the everyday materials that make a variety of special effects noises that they hear in the movies they watch. 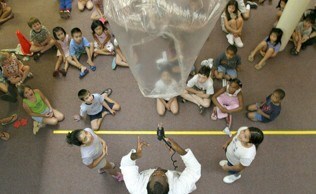 This is an interactive, hands-on workshop that turn preschoolers into “Junior” Astronauts who will travel into space. We will discuss the special clothing Astronauts wear to keep them comfortable and safe. We will also discuss the sun, the planets, and other objects in space that make up our solar system. This workshop will provide preschoolers with an opportunity to get their hands dirty while learning all about worms. They will work with magnifying glasses to get an up close and personal look at the lives and habits of worms. Children will be excited to learn all about their fine feathered friends when they look closely at birds. They will discover what eggs are produced by which species learn how a bird’s beak is a tool and also, how to identify different bird’s songs. Animals make different sounds and noises, they have different types of coverings for their bodies. Animals look different from the time that they are babies to when they are adults. Some animals are pets at home, some live in the zoo and some live in the wild. In this workshop we will learn, the Mad Science way, all about our Animal Friends. Let’s learn all about the science behind things in the ocean with this hands on look at the sea, sand and surf. We’ll find out how sand is created and observe shells up close. We’ll even discover what creatures live in the sea and play a game with a “pretend” turtle. What do a doctor, a musician, a carpenter and a potter all have in common? They all use their sense of touch to do their job. Join us as we introduce children to the five senses as they learn which parts of their body are associated the senses, how each sense works and the role that their brain plays. Learn about the human body and the amazing things that it can do. Meet “Mr. Bones” and learn all about our skeletal system. Learn about the parts of our body that we can see, and some of the parts that we cannot see. Music comes from lots of different sounds and instruments. We’ll talk a little bit about sound and how musical sound is made by vibrations. You can make vibrations by tapping, rubbing, plucking, shaking and blowing into instruments. We can also make music with our bodies. 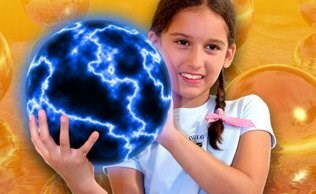 Take a voyage to the center of the Earth! Investigate the powerful processes that shape the planet and form remarkable rocks, magnificent minerals, and glittering gems! What has 96 lets, 32 eyes, 48 body parts, 32 antennae and so many amazing adaptations? A whole bunch of bugs! Discover how insects see, eat, protect themselves, and even help out humans. Mad Science will launch you in to the Science of Flight as we discuss why, even though all rockets are different sizes, colors, and designs they all have some basic parts in common. Then we’ll all go outside and launch our very own rocket while we all have a “Rockin” good time. **To run this class, we must be at a location where we have explicit permission to launch a rocket.